Let us remark that we are dealing here with combination of signs with differing degree of motivation, not with the combination of images and signs, which are dealt with in 'Entwining of mimesis and semiosisd'. The classification of the examples learns that there are two kinds of combination: a purely additive: combination and the more sophisticated condensation. - 'this is really BIG': the size of the letters is the visualisation of quantity. - in scores, pitch is visualised by 'height' on the staff, whereas duration is rendered in an unmotivated code. - the sound of a word used as an imagesign: in words like 'cuckoo''. .
(04) combination of objectsigns with unmotivated signs. (10) combination of objectsign with symbol? A striking example of combination of visualisation with imagesign, that eventually leads to a complete replacement of the visualisation with the imagesign, is the road map. 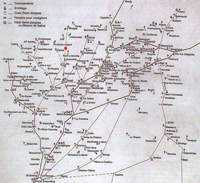 Driving directions are invisible, but we can visualise them through a line, as when we visualise the invisible orbit of a planet: think of a metro map, or of the map below on the left, with routes converging in Santiago de Compostella. On the second map, the position of the cities is no longer arbitrary: it corresponds with the real geographical position of the cities, the rendering of which is motivated through visual analogy (translation of the degree of latitude and longitude in 'height' and 'breadth'). Such a rendering coincides with what we would get to seem from a bird's eye view. Thus, we can read the points as visualisations that are additionally motivated by images of cities which are essentialised and idealised, whereby the size of the circles can function as a sign for the size of the cities. 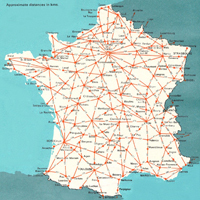 On the third map, also the visualisation of the driving directions is additionally motivated through visual likeness with roads, as they would look like from a bird's eye perspective. The highways are rendered through two red lines, which we can read as tracks, separated through a yellow line. We may compare with the rendering of the circulatory system. The visual likeness is essentialised and idealised in view of the readability of the sign: the red and the yellow discerns the highways from ordinary roads, which are red or yellow, and from rivers, which are blue. The additional motivation may become so dominant, that the map is no longer read as a visualisation of driving directions, but as a strongly essentialised and idealised image of a road system, on which we can also read driving directions, so that the visualisations has become an imagesign in that respect, comparable with the rendering of blood vessels in a body. The transition from visualisation to imagesign is enhanced through the additional rendering of rivers and railways, whose colour is also adapted to the demands of a colour code. How much we are dealing here with an in essence analog visualisation of driving directions, is evident from the introduction of the given 'France'. The borders of a state are invisible. 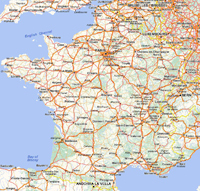 'France' can only be rendered as a visualisation, not as an imagesign. On the right, the invisible border is rendered through a yellow line with black crosses. On the right, the equally invisible border coincides with the coastal line, just like driving directions coincide with highways. But the coastal line is not an image of the border, but rather a visualisation that coincides with the image of the coastal line. How much we are dealing with visualisations here, is evident from a comparison with an image. On the satellite photo below, only the optical image of the coastal line is to be seen, whereas the border is invisible on the coast as well as on the continent. That map of an island like England is not an image of an island, although a line drawing of it would not be discernable from a map: in the former case we are dealing with an image, in the latter with a visualisation of a border. That is most evident from a satellite photo of Switzerland, where there are no borders to be seen at all, so that we have a rather difficult time in finding out where the country is to be found.